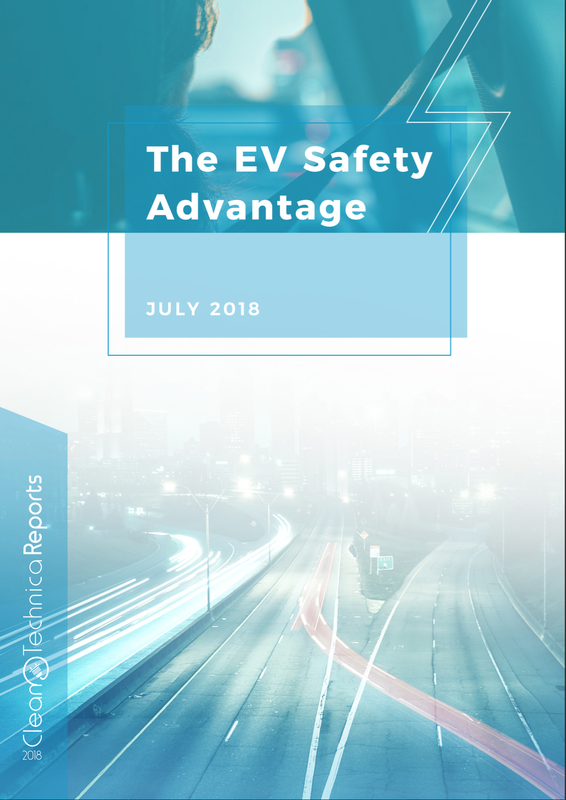 In this section of the report, we roll through a handful of clear EV safety benefits, which help to explain electric cars’ better performance in the case of accidents and subsequent insurance claims. We also throw in more safety ratings and charts. Note: Yes, we need to update the report to include Model 3 ratings, and we will do so once some more are published. ⇒ The absence of an engine in the front of the vehicle improves the crumple zone of EVs. ⇒ The centered location of battery packs vastly reduces the torque forces in a car accident. 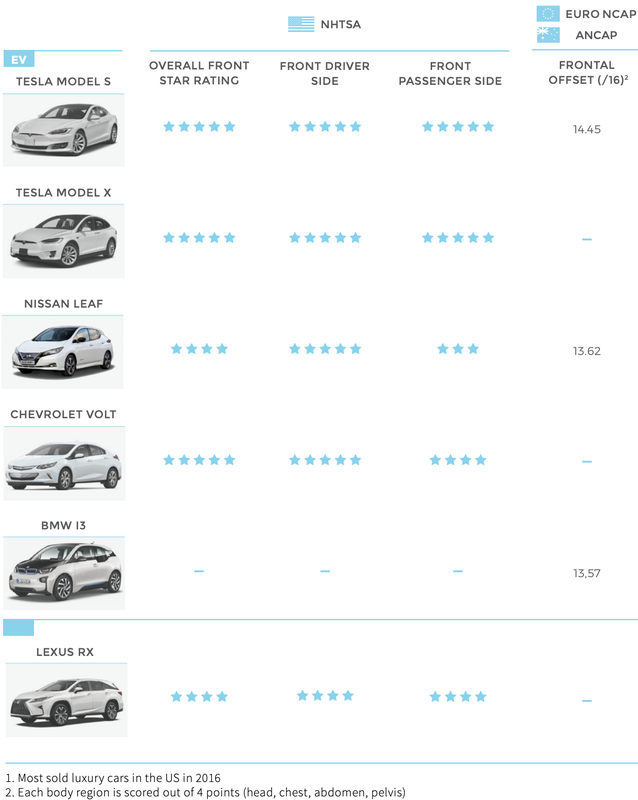 ⇒ In terms of frontal crash tests, EVs are comparable to high-end ICE vehicles. ⇒ 2% of crashes involve a rollover, but they cause 35% of deaths. ⇒ Large battery on the base lowers the center of gravity and reduces the rollover risk for EVs. 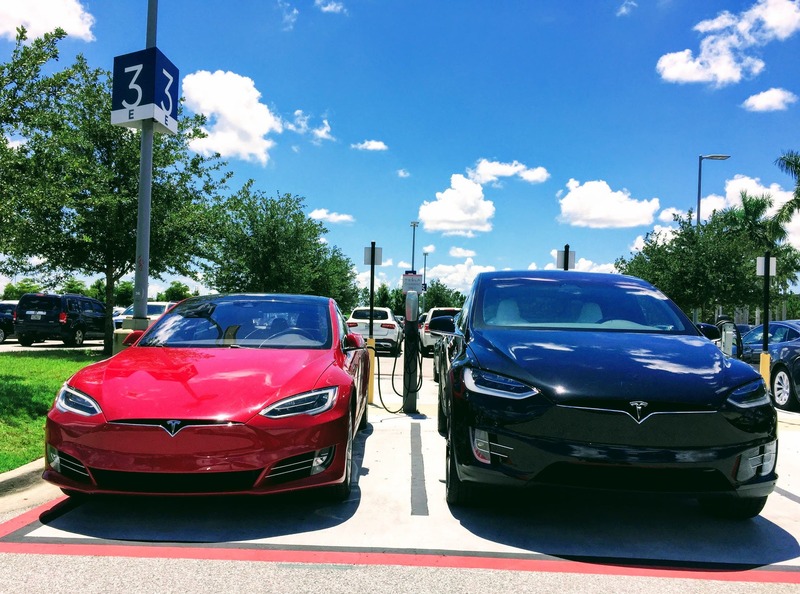 ⇒ Tesla Model S achieves a record low 5.7% rollover likelihood in a single-vehicle crash, and Tesla Model X achieves the best rating among comparable SUVs. ⇒ Electric vehicles benefit from better dynamic stability due to a centered battery pack and electronic control of power and braking. Note: Static Stability Factor (SSF): NHTSA rating of rollover propensity with a static measurement of a vehicle’s shape and weight distribution, derived from a formula that compares a vehicle’s track width with its center of gravity height. 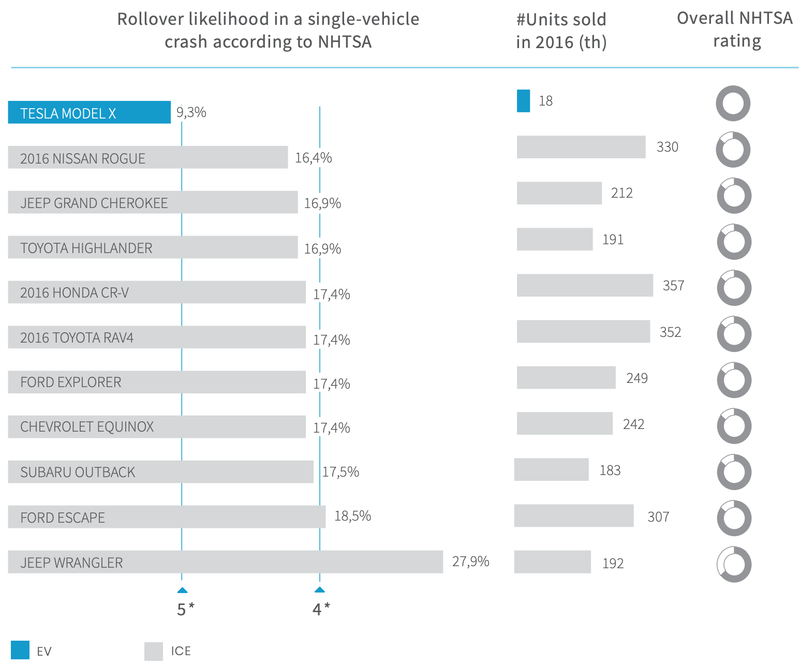 NHTSA combines the SSF and dynamic test to assign a rollover-resistance score of one to five stars. Five stars represents rollover likelihood in a single-vehicle crash at 10 percent or less; one star predicts a rollover likelihood of 40 percent or more. The SSFs underlying the star ratings vary from about 1.0 to 1.5. (The higher that number, the better.) SUVs usually measure out at 1.0 to 1.3, and cars normally fall in the range of 1.3 to 1.5. 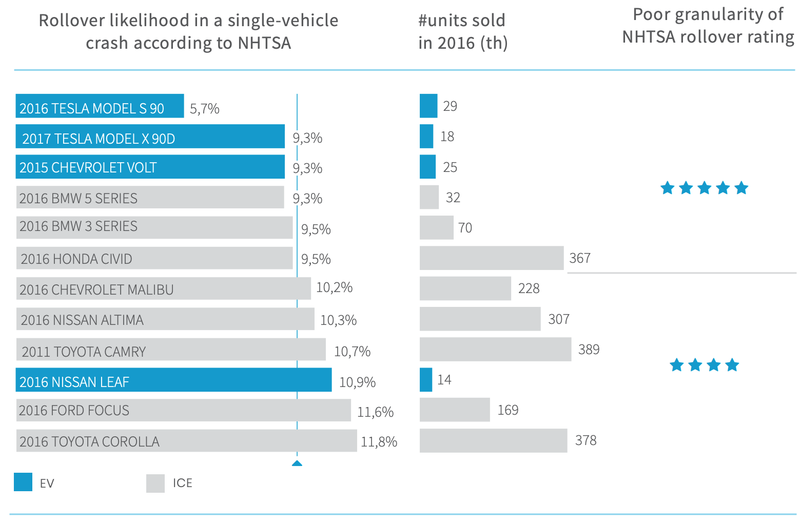 Note: Comparison of 10 most sold SUVs in the USA in 2016 and Tesla Model X. 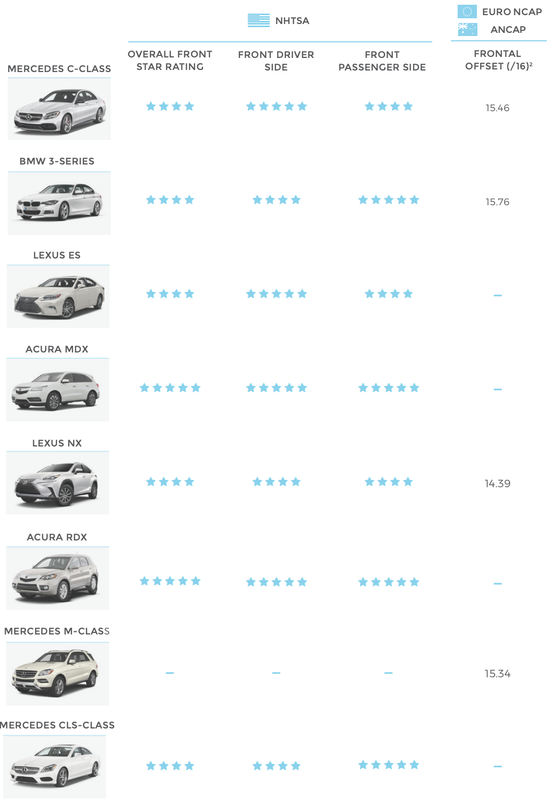 ⇒ Tesla Model X is the first SUV ever to get the top score in all of the component ratings, including rollover risk. ⇒ SUVs have a higher center of gravity and are more prone to roll over than a typical family sedan. But the EV model has a heavy battery pack at the bottom of the car, hence a much lower center of gravity than the typical SUV. ⇒ According to Tesla, NHTSA’s tests found that people inside a Model X have a 93% chance of walking away from an accident without serious injury — second highest on record behind the Tesla Model S.